This post was originally published on August 17, 2009. It was substantially revised and re-posted on August 24, 2015. Looking for a nickname-proof name with history for a daughter? Here’s one that fits the bill. 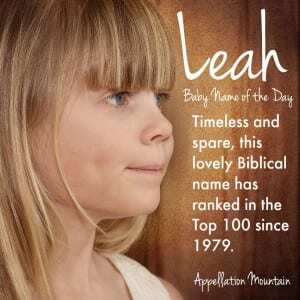 Thanks to Photoquilty for suggesting Leah as our Baby Name of the Day. Leah, she of the tender eyes, spends much of the Book of Genesis in competition with her younger sister, Rachel. They both marry Jacob and both bear him children. Several meanings are suggested: weary, cow, ruler. What we know for certain is that the name was among the Old Testament choice to find favor following the Protestant Reformation, and was in use by the late 1600s in the New World. The name hovered around the US Top 200 in the nineteenth century, then fell into the 300s and 400s in the 1940s and 50s. By 1979, Leah had broke into the Top 100, and has stayed in or near the Top 100 ever since. The name peaked in 2010, at #24. This makes Leah a mom name and a little girl’s name at once. 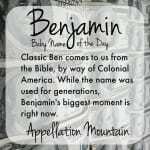 Combined with Biblical roots, it also makes the name feel timeless. Late nineteenth century novelist Belle Kendrick Abbott’s Leah Mordecai is the story of the challenges faced by a young Jewish woman growing up in the South. Celebrated Israeli author Leah Goldberg wrote everything from poetry to children’s stories. Actresses include King of Queens‘ Leah Remini and Glee’s Lea Michelle. Roy Orbison recorded a single by the name in the 1960s. Donnie Iris scored a hit with “Ah! Leah!” in 1980. One of the Gosselin sextuplets of Kate Plus 8 fame wears the name. It’s the name of a werewolf in the Twilight series. Actor John Schneider has a daughter called Leah. So does Chicago mayor Rahm Emanuel. That’s an awful lot of Leahs, right? That’s the trouble with Leah, of course – we’ve all heard the name again and again. It’s not just Leah, either. There’s also Lee, popular for boys and girls for years, as well as Leigh, which peaked in the 1970s. Layer in all of those girls with names ending in -ley, -lie, -lee, -leigh, and -lea, and the sound is quite familiar. The US Top 100 is also home to Ella, Lillian, Lily, Layla, Aaliyah, and Ellie, with Eliana, Liliana, Delilah, and lots of other lovely L-heavy names not far behind. Alternate spelling Lia charted at #377, and hold-the-h Lea at #676. Despite such a long history of use, Leah remains far more ageless than many a 1970s favorite. It’s tough to imagine a newborn named Stacy or Amber in 2015. But Leah still seems pitch perfect. 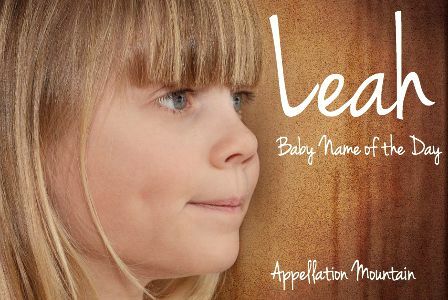 If you’re after a nickname-proof name for a daughter with deep history, and a current, but not trendy, feel, Leah is one to consider. What do you think of Leah? Is this name timeless, or is it starting to fade? My middle name is Lea, pronounced like Leah, but my mother intended it to be the feminine version of Leo, which means “lion”, and thus Lea would mean “lioness”. Not sure of the accuracy, but that was her logic lol. As an aside, Amber is a guilty pleasure of mine and I’d love to see it on a newborn. I think Leah is a sweet name, the kind that grows up well and carries a certain dignity. Leah has been my favorite name since I was 8 years old. I’m now in my mid twenties! I was very serious about naming a daughter this and even told my husband before we got married how I loved Leah. I thought Leah Noelle was perfect! My husband was fine with it because he knew how strongly I felt. Then a friend, although a casual friend, named her daughter Leah Noelle. YES!! The exact first and middle name I had picked! How does this happen?? I was devastated and, of course, cried. I grieved and then we decided we could still use Leah anyways. Since then, my tastes have changed to a bit more unique and less common names (think Evadne, Calliope, Juno, Honor, Geneva, etc.). I doubt Leah will be used at this point, but who knows? It still holds a special place in my heart and I’ll always love it. It’s just beautiful! Actually, there really is no alternate spelling for the name Leah. It is what it is. L-e-a-h. Those other names are names, nice name, however, not alternative versions of the name Leah. No one offered Rachel’s sister alternatives and no Leah since then received offers either. Reading the comments that say it is such a common name is funny to me. When I was a child, I was sure I was the only person on the planet with parents mean enough to name their offspring Leah. I absolutely hated the name and constantly pleaded with them to let me legally change it, alas, they told me I would have to wait until I was 18. I had no personalized key chains, mini license plates, mugs or pencils. Aging made the name pleasing. I went on to spend some time enjoying my unique moniker. Sadly, it was when I began seeing Leah novelty items; I felt the decline to common. Woe. Amen! As another Leah, I would like to repeat everything you have just said. Leah feels very dull and tired to me, like Emma. Leah is nice. But in a Claire, Sinead and Roisin sort of way. It’s just a normal everyday sort of name, not unexpected and I think I’d rather something more unusual when I have a kid. I’m not gonna even start on Leigha…! Oh, and I haven’t seen it yet so any chance of suggesting Lorcan for NotD please? Leah is…okay. I think it’s pretty, but with all its usage, it does feel a little tired. At least it did when I was a child and knew 3 Leahs. I was totally unexpected to see it suggested so often on the Y!A name boards. I guess it’s having a resurgence of some sort. I’m decidedly more fond of Lia and Lea. OOH, when I was in grade school, Leah was my FAVORITE name. However the Gosselin and Twilight connections taint it for me and I probably wouldn’t use it anytime soon. It’s still on my maybe list though because its so Pan-European and would work most anywhere. Leah doesn’t excite me too much. I can agree that the Leah spelling is the more desirable one, but only Leigha really is an issue in my eyes (it kind of looks like it would be said “LEE guh” spelled like that).